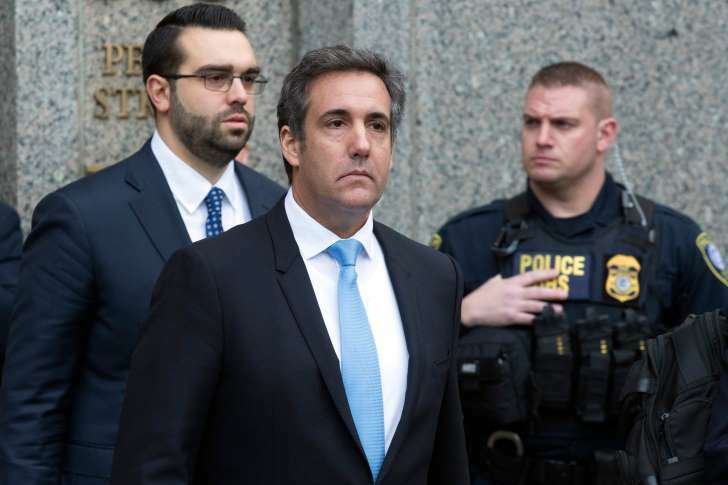 © AP Photo/Mary Altaffer/File In a Monday, April 16, 2018 file photo, Michael Cohen, President Donald Trump's personal attorney, center, leaves federal court, in New York. After FBI agents raided the home and office of one of his personal lawyers in New York City – seizing client files, recordings, and computers – the president lashed out, suggesting federal prosecutors and investigators had gone too far. “An attack on our country,” he called it. That’s not all he did. A few days later, Mr. Trump granted a full pardon to a former top aide in the Bush administration, Scooter Libby, who had been convicted in 2007 of perjury and obstruction of justice in a classified information leak case. The White House says the pardon was an act of clemency to correct a lingering injustice done to Mr. Libby by an overzealous special prosecutor. Trump critics accused the president of acting with a darker motive. “This is the President’s way of sending a message to those implicated in the Russia investigation: You have my back and I’ll have yours,” wrote Democratic Rep. Adam Schiff of California on Twitter. The Constitution assigns exclusive authority to the president to grant pardons – but the full scope of that power has never been tested. That may soon change. A year into special counsel Robert Mueller’s Trump-Russia investigation, the stage is being set for a potential constitutional showdown, as increasingly aggressive tactics by Mr. Mueller are countered by a president who seems increasingly willing to wield executive power in unprecedented ways in response. And one of Trump’s biggest weapons may be his ability to issue pardons. Mueller was appointed to investigate alleged collusion between the Trump campaign and Russia to meddle in the 2016 presidential election. But the probe has expanded to include tax issues, lobbying, and business practices of Trump associates that the president’s supporters say have nothing to do with Russian interference in American elections. The widening scope of the investigation has left Trump clearly frustrated that his presidency is being undermined by an ever-expanding cloud of suspicion that he seems powerless to dispel. But there is one area where the president’s authority is nearly absolute. Legal experts agree that the president has broad power to issue pardons. Yet there is substantial debate about how and when the president can use this authority. Some constitutional scholars believe that a presidential pardon is only valid when it is issued for reasons of sound public policy that are unrelated to any self-interest or self-dealing by the president or his close associates. They say that if a president acts with a corrupt purpose – to cover up wrongdoing by himself or others, for example – the pardon would be invalid. Others say that even a pardon granted for a corrupt purpose – such as in response to a bribe – would be valid, although the bribery itself would be a crime. Some scholars go so far as to argue that the president could pardon himself – though they point out that such a move could be political suicide for a sitting president, should the public perceive the action as an admission of guilt or an attempt to cover up wrongdoing. Moreover, the Constitution makes clear that a presidential pardon grants no protection from impeachment. If enough members of Congress saw the move as an abuse of power or obstruction of justice, the president could be removed from office. In 1992, with only a few weeks left in office, President George H.W. Bush pardoned his former Defense secretary, Caspar Weinberger, and five others charged in the Iran-Contra scandal. The pardons came 11 days before Mr. Weinberger was to stand trial. President Bush did not pardon himself, but the action insulated the president from potential criminal exposure, effectively ended the Iran-Contra investigation, and enraged independent counsel Lawrence Walsh. “The Iran-Contra cover-up, which has continued for more than six years, has now been completed with the pardon of Caspar Weinberger,” Mr. Walsh declared in a bitter statement issued after the pardons were announced. The most extreme scenario involving the pardon power would be if, shortly before leaving office, the president issued a self-pardon. Former President Richard Nixon is reported to have considered a self-pardon for the Watergate break in and cover up, but instead resigned and was pardoned by Gerald Ford after he became president. Despite the collective experience of 45 presidents over more than two centuries, legal experts are unable to say definitively whether a presidential self-pardon would be valid. Professor Kalt says there are strong arguments on both sides of the debate over presidential self-pardons, but that ultimately he believes the Constitution does not authorize the president to hold himself above the law. “A pardon is something that you give to someone else,” he says. Other constitutional scholars embrace a more robust view of executive power. “The text of the Constitution just says he can pardon offenses against the United States. When the president violates the law, he has committed an offense against the United States, so why wouldn’t he be able to pardon himself?” asks Saikrishna Prakash, a professor at the University of Virginia School of Law. Nor must a presidential pardon be in the public interest to be valid, says Professor Prakash. One example: former President Bill Clinton’s pardon of fugitive financier Marc Rich in 2001. Mr. Rich allegedly owed $48 million in back taxes and had fled to Switzerland in the 1980s. The pardon was granted in the final hours of Mr. Clinton’s term in office. It came after Rich’s ex-wife had donated $450,000 to the Clinton library and $100,000 to Hillary Clinton’s Senate campaign. In the case of Scooter Libby, there is no suggestion that there was any payment or improper inducement to win a pardon. Rather, the allegation by critics is that the pardon was granted to send a message to Trump’s associates – including his besieged personal lawyer in New York, Michael Cohen – not to cooperate with federal prosecutors. The White House denies sending any implied message to targets of investigations. “Pardoning Libby was the right thing to do after the principle witness recanted her testimony,” White House Press Secretary Sarah Sanders told members of the media. Alan Dershowitz, an emeritus Harvard Law School professor who has been a frequent Trump defender, told CNN’s Anderson Cooper on Monday that it would be “inappropriate” and potentially an impeachable offense to offer a pardon in exchange for a witness’s silence during an investigation. Mr. Dershowitz said the pardon itself would be valid, but warned there might be significant negative consequences for a president who issued it. Administration critics say the Libby pardon was not the first time the White House has suggested it might issue pardons to those caught up in the Mueller investigation. The Trump lawyer, John Dowd, denied that he had any discussions about pardons with the men’s lawyers. He resigned as the president’s lawyer last month. Both Mr. Manafort and Mr. Flynn were subsequently indicted. Despite the alleged pardon discussions, Flynn has pleaded guilty and is cooperating with prosecutors. Manafort has pleaded not guilty and is facing two separate trials in federal court in July and September. Mr. Comey was the FBI director who initiated the Trump-Russia investigation. He was fired by Trump in May 2017, prompting the appointment of Mueller as special counsel. In an effort to head off any plan by Trump to use his pardon power to undercut federal investigations, Congressman Schiff has introduced legislation that would compel public disclosure of any underlying connections between the pardoned person and the president’s interests. “At a time of constitutional peril, it is incumbent on the Congress to stand up for the rule of law by creating a strong disincentive to the president issuing pardons to protect himself and obstruct ongoing investigations,” Mr. Schiff said in announcing his bill. The Abuse of the Pardon Prevention Act would require the Justice Department to make public all evidence against the recipient of a pardon when the president pardons someone in connection with an investigation in which the president or one of his family members is a target, subject, or witness. The measure, as currently written, is backdated to the beginning of Trump’s term, Jan. 20, 2017. Democrats outside Washington are also moving to head off possible efforts by Trump to wield his pardon power in ways that might undercut federal investigations. While a presidential pardon is complete and unreviewable as it applies to federal law, that is not necessarily the case for violations of state law, according to legal experts. Many Trump critics have suggested that the attorney general in New York could file state charges against those pardoned by Trump. New York is the location of Trump’s former primary residence and his business headquarters. But there is a problem with that tactic. New York law currently grants full recognition to presidential pardons. That means that any attempt to prosecute someone for a pardoned crime would violate the constitutional principle that no one should face criminal jeopardy twice for the same offense. In anticipation that state prosecution might be necessary to hold Trump associates accountable, New York Attorney General Eric Schneiderman is asking the state legislature to close what he calls a “double jeopardy loophole” that might allow someone to escape accountability “merely because of a strategically-timed presidential pardon,” he said in a statement. Despite such concerns, legal analysts say a pardon wouldn’t necessarily end an ongoing investigation. Once a pardon is given, the recipient loses their Fifth Amendment right against self-incrimination related to the pardoned crime. That means that a pardoned individual must testify fully and truthfully. If they don’t, he or she can be charged with lying and obstruction of justice. In fact, in the hands of a skillful prosecutor, a pardon could actually advance an investigation rather than hinder it, legal experts say. This article was written by Warren Richey from Christian Science Monitor and was legally licensed through the NewsCred publisher network. Please direct all licensing questions to legal@newscred.com. Politics - U.S. Daily News: Can Trump counter Mueller by handing out pardons?